Airtime is a platform for video conversation to connect you to old and new friends. 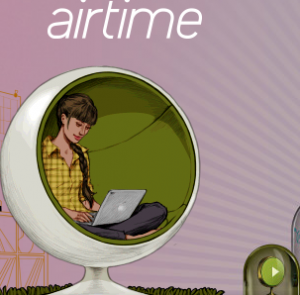 Immediately in our testing, we are impressed by the interface of Airtime. It’s fun, artistic and looks like a lot of thought has been put into it for the users’ entertainment and benefit. To launch airtime, you must have a Facebook account since it is integrated into your Facebook experience. You aren’t required to download anything to your computer, just go through the simple process of connecting it to your Facebook account. It’s an easy way to use video chat with your Facebook friends and connect to more video chat possibilities. You can record and play videos for anyone through Airtime and they also have a feature that can help you make new friends. You can search for people using Airtime time that share your interests, so Airtime won’t just connect you to any random person. Airtime does have some safety and security settings that you should know about before using this webcam service. Airtime uses Facebook permissions in order to optimize your chat experience since it works through chat, but it also has some monitoring features depending on the call. They only monitor matched calls, meaning chats between people who are not friends through Airtime or Facebook yet, which involves them taking snapshots and running certain automated security programs. They do value your privacy however and will not monitor messages or video calls between friends. Airtime is not available to everyone. You must be over the age of 13 years and have an active Facebook account, but there are limits even on those who meet those needs. Due to legal, language and technological constraints not everyone on Facebook can use Airtime to meet new people with their account. How many Facebook friends you have on Facebook can also influence what restrictions are placed on your account as you need a minimum amount to “maintain site integrity”. If you meet the requirements, however, we would highly recommend this webcam service as a good addition to your experience on Facebook. It seems fun and interesting, and a lot more secure than many of the other sites out there that offer similar services. It seems easy to use and very professionally designed. They are still growing since they are relatively new, but there is already a lot there to explore and enjoy.